Digital signage systems are generally thought of as a separate stand-alone technology that distributes preset content to a display network throughout an entire organization. The content is actively managed by an administrator who periodically posts text, image and even video updates. This content repeats until it's updated or the playback schedule changes. Sure, digital signage companies also make available some dynamic, continuously updated pages, such as news, weather and stocks, but they tend to be from outside sources that are managed by the digital signage company. From the beginning, StrandVision has offered these types of dynamic information from outside sources. There are also powerful benefits to using this low-cost digital signage network as more than a billboard of company products or employee communications news by having the electronic signs become an integral part of an organization's marketing, customer service or operational functions. This capability that I'm calling a digital white board, marries corporate information with digital media player displays to automatically present ever-changing business information in an easy-to-view, easy-to understand, graphical format using a standard digital signage network. Digital white boards call for a more sophisticated electronic signage system - one that can dynamically acquire data from internal corporate systems, format it and present it on one or many digital signage displays in near real time. This requires the ability to integrate into queue management, production, warehousing, human resources, accounts payable or inventory data systems. For sophisticated applications it may even require access to data from corporate Enterprise Resource Planning (ERP) systems. Queue management is one of the most straightforward and effective applications for digital signage white boards. Whether it's for a queue at a deli counter, the motor vehicle department, a merchandise pick-up location or a customer service center, visitors are glued to the digital screens waiting for their number to be called. This is a great opportunity to post informational and promotional messages, even paid advertising. You'll never have an audience that's more focused on a video screen than you will when your customers are waiting for their number to be called. These types of single data source applications are generally relatively easy to set up from a technical standpoint. They simply involve tapping into a data output to feed the information into the local digital signage media player or network. For StrandVision Digital Signage subscribers, all they have to do is log onto their content management system (CMS) portal to designate a frame for the feed. Then they select the split-screen region for the queue customer call information and dedicate the rest of the screen to another frame that shows the full assortment of the promotional and/or informational messages. There are many more sophisticated electronic white board situations that bring together data from different sources and present it in a consolidated color-coded display. Some of these are for retail situations, such as for customer pick-up locations that are tied into inventory systems. Other applications involve more complex systems that draw information from multiple data sources. 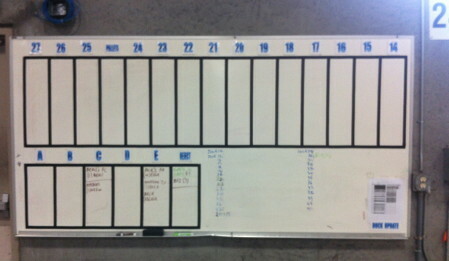 These employee-facing white boards are typically used in support of production, warehousing, call center and other service operations. At StrandVision we recently worked on a shipping/receiving application for a Fortune 500 company. This project involved custom programming to gather shipment arrival time, in-process time, scheduled departure and current status as well as other important information - 13 fields in all. We also did the integration to the receiving side of their business. Much of this information (not all -- because it was too complex) had previously been tracked using - you guessed it - a white board. The process was cumbersome, hard to keep current and therefore often out of date. The white board is being replaced by a StrandVision Digital Signage digital media player display at each dock. We custom-designed management, communication, setup and web/signage reporting software for this application in coordination with their IT folks. Not only was it cost effectively accomplished, but the system was scalable to expand to other facilities at no additional charge. It's important to note that with our pre-packaged bar coding software experience we've learned how to "look, but not touch" the source database - in this case the ERP system. We're familiar with working with IT staffs to consult on the hands-off data gathering system. Often, it comes down to simply explaining the various methods that StrandVision can use to process the data and then the IT staff immediately understands our approach and sets up the internal systems to serve the data to a location in one of the many formats and communication mediums that we can retrieve. In this case, StrandVision provided data integration consulting services on a very cost-effective hourly basis. For this installation, they opted to maintain total security and control by delivering changes to the databases to our servers instantly via File Transfer Protocol (FTP) from the source ERP. The custom StrandVision Digital Signage application harvests the necessary information for each of the designated fields on the digital media player display. Our approach makes it possible to consolidate data from one source with other sources on an ERP system or other specialized application, such as warehouse, materials, or manufacturing management systems. The consolidated data populates one custom background template for four pages showing upcoming and completed shipments into and out of the facility. The color-coded, easily readable, frequently updated display replaced the white board right at the loading dock. 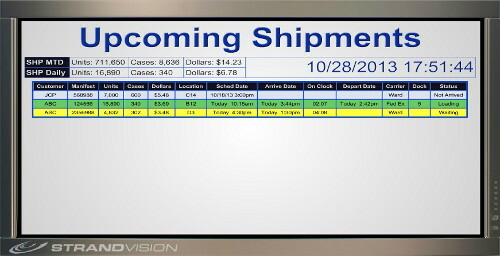 This type of digital white board application can mix with regular digital signage information, such as employee announcements, news and weather, although this company chose to have the various whiteboard shipment and receiving information visible at all times. I encourage you to think about your customer service and operations to see if they can be improved by providing timely information when and where it's needed through a digital signage white board application. It's a simple, cost-effective approach that can effectively select and show relevant information in lots of eye-catching ways from the massive amount of data that today's systems generate for use when and where it's needed.